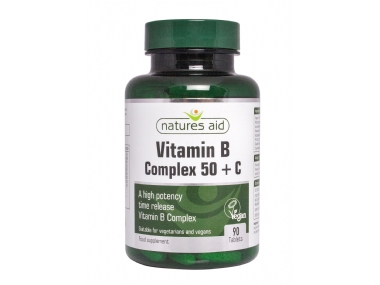 We sell Natures Aid products like Vitamin B Complex 50 + C High Potency - 90 tablets online in the UK and directly from our award-winning store in Scotland. High Potency B Vitamin Complex with Vitamin C.
Take1-2 tablets a day with food. Do not exceed the recommended intake. Where can you buy real Vitamin B complex 50 + vit C 90's safely online? If you are wondering where you can buy Vitamin B Complex 50 + C High Potency - 90 tablets safely online in the UK, then shop with us. Vitamin B complex 50 + vit C 90's - Vitamin B Complex 50 + C High Potency - 90 tablets in Vitamins A - Z and Vitamins and Minerals.